I guess I have to just build up some confidence and tell myself that I've done enough toiles and fittings that nothing (or only a tiny bit) can go wrong! The thing that I'm actually thinking a lot about is MY dress. 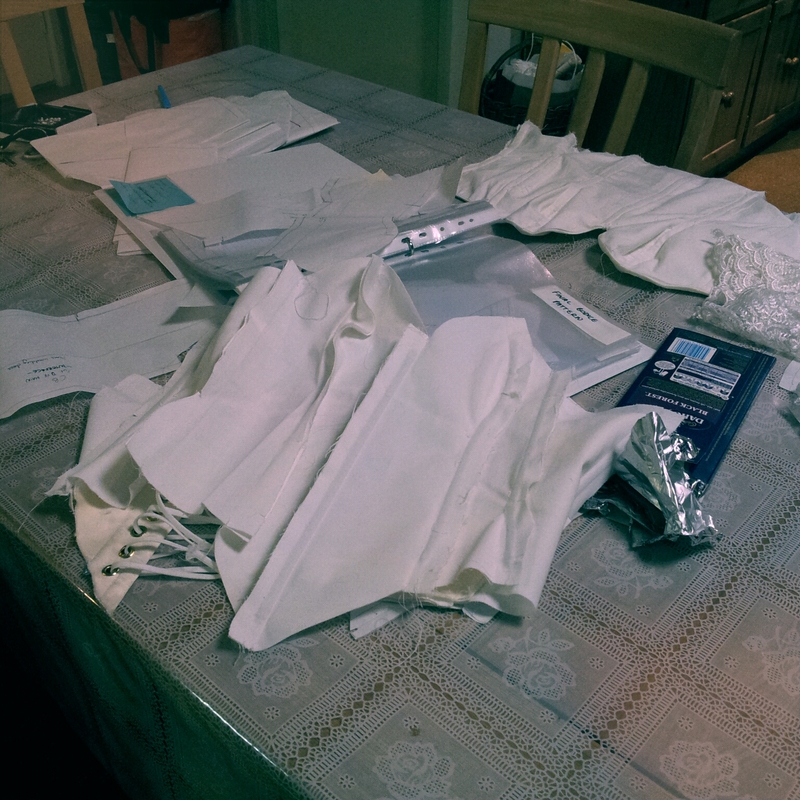 I finally have a chance to make myself a beautiful garment, to wear to a botanical garden wedding! Could I be any more excited? The problem is though.....what do I make? I mean, how often does a 21yr old do I get to wear a truly gorgeous dress? Never, pretty much. And I already have a few at home which have never seen the light of day. I want to make something a bit more elegant and feminine than my normal style. Most dresses I make have full skirts that I guess are quite girly, but I think I want to go for a more draped elegant style. But now the problem is what style and pattern? Well making one that is, because I really don't think I can be bothered buying patterns anymore and then fitting them to myself. But what design? What features? What colour? What fabric? I'm finding this dilemma very comparable to say, eating out somewhere expensive? As with someone my age, how often do I get to eat out and dine on something truly delectable? Close to never, as I am yet to find a gentleman with enough schmooze and cash to do so. I figured these Melissa's I already have will be perfect to wear to an outdoor garden wedding! No heal sinking issues, and no issues with them getting dirty! Win! 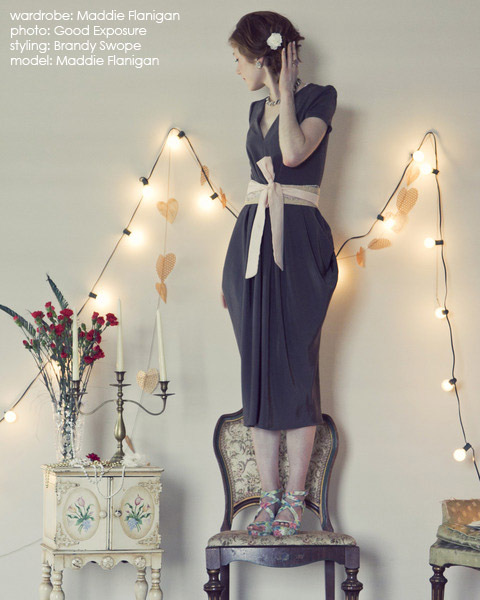 There are a couple of dress's I've found online by some lovely sewers that have caught my eye. The main on being 'The Dress' made by madalynne who has a very wonderful blog, and probably has my dream job! Her dress was based on this BHLDN gown. Seriously have a look through their website, some quite incredible dresses. This colour combo looks great on us 'fair' types. I generally cant wear black because it's just far to harsh on me with my light hair as well. After a lot of thinking, this is the dress design IIthink I'm going to go with, and a similar colour scheme. She choose great colours to match her (and my) fair complextion. I even went through a huge swatch card of colours, and I still came out with almost the same picks! All I did was post a comment and she sent me an email directly! Similarly she made this dress to attend a friends wedding. Below are some other designs that deserve a particular mention, as both have had some cconsiderable though put towards them. So Sew Lovely posted her flip turn dress based on the pattern magic book about two weeks ago. She really gave life to this dress. I wasn't overly drawn the pattern by the pictures in Pattern Magic, so it's great to see it made up so wonderfully! Its a very versatille dress pattern now that I see it, and I think it could be done up really chic in a medium weight silk. I'd probably add a bit more fullness to the 'flip' area, so a few more folds fell through, and then maybe some length to the end that comes through. Lastly, found this is a magazine a fair while back and really liked some of the feature's. Others are not quite to my taste, but essentially from the waist down, pretty stunning, reminds me of the shape dresses from the early 1900's created. I really like the pleated zig zag feature, It would be a lot of work to get it right, but its gorgeous and screams couture! I'm thinking I'll treat myself to some (very well researched and priced) 4 ply silk. Two colours I think Ill use. Probably more the second, with highlights or accents of the first to match my shoes. However this fabric is $60 per YARD! Eeep! and without postage You can see above that I love the colour combination madalynne has used! I've found another website which sells 4 ply silk for $35 per meter, but the colours aren't as nice from what I can tell, because it's a bit of a dodgy picture of a sample card! Oh oh wait I just found on Mood fabric it is $40 per yard and has a great colour range! ^__^ YAY....too bad they don't have an international postage option on their page! Please leave your opinions/thoughts/ideas! I'd love to hear them! Or if you know a good fabric store on line for buying some beautiful 4 ply silk, hit us up!! Hi! :) Just found your blog. Sewing a wedding dress is a great project, I made my own dress too. It took ages, but what's the rush, right? :) Love the purple, but try not to blend in with your bridesmaids. This is your day to stand out! Hello! Thanks for leaving some kind words! It's always nice to meet someone new. I feel your pain! I'm sure the wedding dress will turn out fine- have faith! As for your dress, I have the Pattern Magic dress pattern here, made up, if you want it. I can send it to you. It's just collecting cobwebs. You can email via google+ or through BurdaStyle. My fav. fabric store is online now- theremnantwarehouse.com.au.....they may have what you are looking for. Great Start to a Thursday!